In his early youth, Gia Eradze fell in love with the circus and decided he would become an animal trainer. From then on, nothing stopped him. 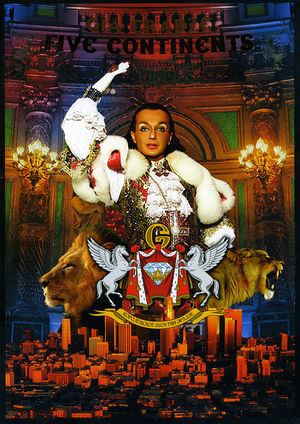 Not only did he become a successful animal trainer, but his rich, extravagant visual imagination led him to create extremely successful shows that helped revive the creative image of the Russian circus at home and abroad, and eventually propelled him to new heights in the Russian circus artistic hierarchy. Gia Giulevich Eradze was born October 3, 1979 in Tbilisi, Georgia—which was then part of the Soviet Union. His father managed a supermarket, and his mother was Rector of Economics at the Tbilisi State University. His was a well-to-do family with no connection whatsoever with the performing arts in general, and the circus in particular. Yet, then as now, Tbilisi was a circus town: In 1888, the Nikitin brothers had built a wooden circus on Golovinsky Prospect (today Rustaveli Prospect), and what was then Tiflis became their home base. 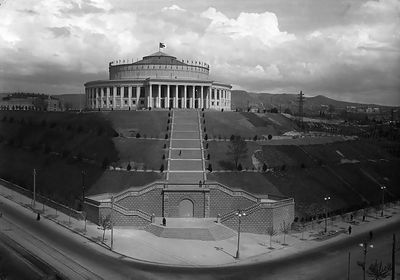 From there, they created a touring circuit for which they used circus buildings they erected over the years in several other cities, including Moscow. The original Circus Nikitin’s structure was destroyed by a fire in 1911, and Tbilisi’s new circus was housed for a long time in a former factory before being rebuilt in 1939 in its present location, on a hill on the left bank of the Kura river. It is there that a young Gia Eradze fell in love with the circus—and especially with animal acts. There and then, he decided he would be an animal trainer. He enrolled in the local Amateur Circus (Youth Circus) and began training in various circus disciplines, but he quickly discovered that Amateur Circuses (and circus schools for that matter) did not teach animal training. Working with animals is something you learn hands on, working with other animal trainers in a circus. Gia was a precocious and strong-willed kid, and his determination eventually led him to truancy: when his father’s car took him to school in the morning, Gia waited until the chauffeur had left and changed trajectory, landing inevitably at the circus. 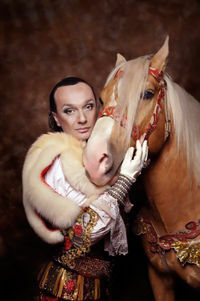 In 1990, at age eleven, he managed to get a job as an assistant (or as a groom) with Nana Milkatze’s Horsemen of Georgia troupe of Cossack riders. For a while, Gia’s mother wondered why, when her son came back from school, a whiff of hay and horses followed him in the house. When the cause was finally discovered, Gia held his ground firmly and made it clear that he had decided to work in the circus and that he wouldn’t budge. As a compromise, his parents accepted his decision, on the condition that he continued his schooling while working at the circus. These were troubled times in the Soviet Union: When Gia became a member of the Tbilisi Circus, it was still part of SoyuzGosTsirk, the Soviet central circus organization. In 1991, however, right after the fall of the USSR, Georgia reclaimed its independence and the circus became the National Circus of Georgia. Twelve-year-old Gia Eradze became an employee of the new Georgian organization and, in addition to his training with Nana Milkatze as a trickAny specific exercise in a circus act. rider, he was tentatively trained as a flyerAn acrobat that is propelled in the air, either in a flying act, or in an acrobatic act (i.e. teeterboard). by A. E. Peradze, head of the Interkosmos flying troupe—although Gia soon began performing with Mikatze’s horsemen. Then he attended Tbilisi’s State School for Circus and Variety Arts, where he completed his circus training... and graduated as a juggler! One may say that he had become quite a versatile circus artist, but he stuck to his guns and began his solo career with a bird act he had trained and created. In time, more animals—and much bigger ones—would join his growing menagerie. Gia had also a fertile visual imagination, and he had ideas of his own with regard to the presentation and the staging of his acts—and of circus performances in general—which met with some resistance from his producers, who belonged to another, more traditional generation of the old Soviet circus and were not prone to listen to a young upstart. The 1990s were a troubled period for the former Soviet circus. Many of Gia’s producers, mostly Russian, toured independently with their own collectives; for them, the goal was not to be innovative but to make money. Yet, one producer was intrigued and impressed enough to listen to him: Gennady Grigorovich Gordienko—whom Gia Eradze calls "my second Papa." In 1999, while they were performing at the circus of Vladivostok, Gordienko offered him to stage a section of the show, a twelve-minute piece they titled Stars of Eurasia. It premiered on January 20, 2000. It was a concept they had imagined together for the stage, but they thought it would work better as a circus piece. Gia’s "attraction(Russian) A circus act that can occupy up to the entire second half of a circus performance." was a huge success. Gordienko continued to help him develop the sometimes-over-the-top visions he had for his presentations and gave him whatever he needed. Meanwhile, Gia’s menagerie grew from birds to all sorts of exotic animals, from pelicans to tigers—and the number of his assistants (in and out of the ring) also grew exponentially. From a bird act, Gia Eradze had developed a full-fledged animal "attraction(Russian) A circus act that can occupy up to the entire second half of a circus performance.," replete with lavish costumes and props and a large contingent of dancers and performing assistants. After Gordienko’s death, Gia Eradze, now a well-established artist, continued to work with other producers, but he didn’t like what he considered their old-fashioned style—or lack thereof. In 2006, he, his menagerie and his troupe took residence at the Circus of Yekaterinburg, managed by the celebrated clown Anatoly Marchevsky. He remained one year with the company but, by then, he considered he had learned enough to produce his own shows. However, his large menagerie was expensive to maintain privately, not to mention his company of assistants and performers. By then, the old SoyuzGosTsirk had morphed into RosGosTsirk and was more or less back on tracks, and Gia decided to join the Russian state circus company—which he did in 2007. He set out immediately to work on what was to become Gia Eradze’s Royal Circus, a circus collective with productions that would be conform to Gia’s vision of a what a circus show should be. The Royal Circus’s first production, Five Continents, opened in 2008. It was the first show that was entirely the fruit of Gia Eradze’s rich imagination. It was different: Ornate, opulent, visually spectacular, and a true production—in that it was not just a succession of acts, but a fully integrated show in which acts were part of an ensemble (a little like the Canadian Cirque du Soleil but without the affectations of a gratuitous storyline). Circus is a visual art, and The Royal Circus offered a lavish feast for the eyes, quite in sync, in fact, with the Russians’ revitalized taste for the rich old imperial imagery. The Royal Circus’s success was immediate, and the show sold out wherever it was presented, including in Moscow (at Circus Nikulin) and St Petersburg (at Circus Ciniselli). Gia Eradze quickly became the premier Russian circus producer (a standing he arguably shares with the Askold and Edgard Zapashny), and a media darling: He could provide spectacular background images to accompany his television interviews! In 2011, he received the Gold Award at the 5th World Festival of Circus Arts in Moscow, and the same year, Five Continents received ten awards at the All-Russian Circus Princess Festival, including the Gold, Silver and Bronze Crowns. In 2016, he received the Master award for best show at the short-lived Masters Festival at Sochi (in which entries were judged by an international jury from videos). To be honest, if Russian awards and prizes were showered over Gia Eradze and his productions, he didn’t have much competition in Russia besides the shows produced by the Kornilov family and the Zapashnys. In a state of artistic lethargy practically since its inception, RosGosTsirk had been resting on the past glory of the Soviet circus and, if some new individual acts were still worth of attention, the creative juices of the state agency had long dried out. The Royal Circus had simply wakened up provincial audiences to a new image of the Russian circus before receiving definite consecration in Moscow. Yet it had received an important exposure that caught the European circus community’s attention. 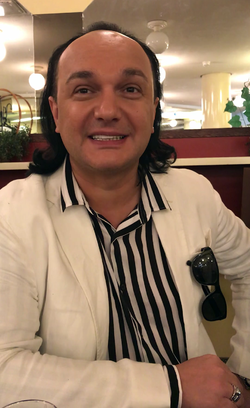 In 2016, after his success in Sochi, Gia Eradze was invited to participate in the 18th Festival Città di Latina in Italy with elements of his show. There, he met with the same success he had known in Russia, and the Royal Circus received the Latina d’Oro—the festival’s Grand Prize. Gia had been the talk of circus professionals and aficionados present at the Festival, and suddenly, everyone wanted a piece of him. 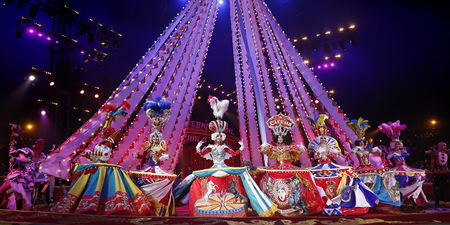 In December 2018, several acts and the corps de ballet of the Royal Circus participated in Stuttgart’s Weltweihnachtcircus, produced by the famous Dutch circus impresario Henk van den Meijden. It was a very successful event, observed with awe by the European circus community—especially since it was a partial preview of what Gia Eradze was to bring to the 43rd International Circus Festival of Monte Carlo. 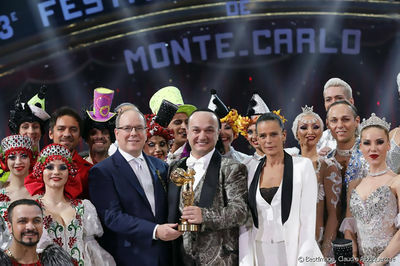 Although, in Monte Carlo as in Stuttgart, he couldn’t bring over his menagerie (only his horses made the journey to perform in these events), the Royal Circus’s important participation in the Festival was an unmitigated triumph; Gia Eradze received the highest accolade in Circusdom, the coveted Gold Clown award. To add to his accomplishment, two of Gia’s acts were awarded Silver Clowns. Gia Eradze’s Royal Circus was definitely on the international circus map—and cast a very bright spot. It was indeed a momentous event for the Russian circus in general: RosGosTsirk, which had been hemorrhaging money practically since its creation and couldn’t shake off its old Soviet-era management system, had been under the Russian Ministry of Culture’s increasing scrutiny for some years and its director, the latest in an long line of short-lived, failing managers, had just been forced to resign. And suddenly, a RosGosTsirk-sponsored production was an international hit! Today, the Royal Circus tours Russia with several companies. Gia Eradze has been elevated to the position of Honored Artist of the Republic of Russia. He is also Honored Artist of the Republic of Georgia.